A recent article in The Age explored the top ten superfoods. Over the last couple of weeks I’ve examined each of the claims and adding a few of my own. Which ones will live up to the hype? The claim: “high vitamin-C content and fatty acids”. The evidence: Let’s get clear once and for all about claims around vitamin C content. Once a plant is picked, the natural vitamin C content diminishes. Cutting, cooking and heating also reduce the available C. If you’ve got a pomegranate tree and pick it just before eating, it would be a good food source of C. Same too if you have a blueberry bush or any other kind of fruit that can be eaten raw. 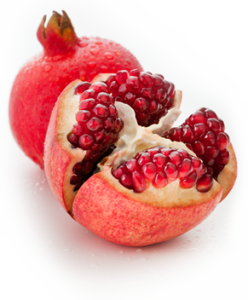 While the seeds (like most seeds) have a good profile of beneficial fatty acids, the research has been done on pomegranate seed oil. The dosage is very different to eating the fresh seed. Value for money: Buying fresh pomegranates can be difficult and in Melbourne they often look quite old by the time they make it to the shops. But surprise, surprise hand in hand with the elevation of pomegranate seeds to the ‘superfood’ list is an Australian company that sells punnets of the seeds through the big supermarkets. It’s a middling priced product. If you have the right conditions to grow an edible pomegranate plant (beware some are ornamental only) then this is the most cost-effective, healthful solution. Verdict: You’d need a huge amount of fresh pomegranate seeds to have an impact on your immune system. The seeds are delicious and easy to eat but due to the oil content in the actual whole seed, it doesn’t win the superfood badge from me. It’s not unusual to see the elevation of a humble food to ‘superfood’ status when a company starts promoting a new product from it.